"Trustworthy and affordable local removal service"
Based in Perth, Huntingtower Removals aims to provide you with a flexible, professional removal service at an affordable cost whether you are relocating locally or further afield. Huntingtower Removals have everything that you need for your next home move. We have the equipment and experience to protect all of your assets and to make sure they are delivered on time. When you choose Huntingtower Removals, you can take comfort in knowing we have the expertise to handle all your moving needs. Since 2014, our company has set a new standard for home removals in Perth UK combining trust and reliability with low cost. We have multiple vehicles, provide packing equipment, and our partnering storage facilities contain purpose-built units to enhance the safety and security of your items whilst in storage. From fine art relocation to a local house move, our professional team can handle relocation projects of any size and variety. Our business is based on trust and reliability. Our highly professional staff have all been trained to deliver and maintain Huntingtower Removals’ service orientated approach, and to provide a high-quality customer experience during what can often be an emotional and stressful time. We are 100% customer focused and provide 24hr support to ensure your move goes as seamlessly and as quickly as possible. We provide a FREE home moving checklist to ensure you do not forget anything during the preparation or actual move. All our staff are experienced in handling heavy items. We also provide bespoke equipment to manage even the heaviest of objects. All our vehicles and staff are fully insured and covered for public liability. Your goods are also insured with our comprehensive goods in transit insurance. "Brilliant company to deal with, answered all my questions. Very obliging team. I required them in a short time frame, nothing was too much bother, happy to help with finding storage for me to help etc. The team arrived this morning and got straight on with it, friendly guys, smiles on their faces, Overall extremely satisfied with huntingtower removals great price that was unbeatable and I will definitely be dealing with them again." 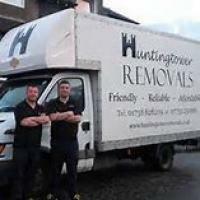 "I have used Huntingtower Removals twice and would highly recommend them . They had some challenges with my large furniture but they mastered it well and in a professional fashion . They go out of their way to assist you in any way required. Will be surprised if you find a cheaper quote anywhere with the same professional service. The lads are a great team....keep up the good work boys." "After researching and getting quotes from several removal companies I decided to go with Huntingtower Removals and I must say I wasn’t disappointed. They were available for a quote at my earliest con...venience and arrived on time and were very professional. We decided to go ahead with their quote as they offered not only the best customer service but the best pricing by far. On the day arrived on time were very well equipped with the right size vehicle and plenty of materials to protect my furniture. I was extremely happy with the service and would not hesitate to recommend them to anyone. Thank you for taking the stress out of moving." "The boys moved us on Friday with smiles all day! What a fantastic team." "Huntingtower Removals assisted with us moving my elderly mother thru from Perth to Glasgow. We were most impressed from first contact right thru to tidying up after removal. Always prompt & courteous.... Packed quickly & efficiently (no breakages! ); and helpful at Glasgow end by moving heavy furniture to try out in different spots. Very obliging! And went above and beyond call of duty by driving with me to drop off my mother's community alarm in Perth: very helpful, as I don't know Perth & have no satnav. We're very happy customers & would highly recommend Kevin and Gerry!" "Excellent service today helping us move out of our old house and into our new one! Couldn't fault them and service was second to none, had more to move than we expected and they didn't seem phased by ...this and still did a great job and moved the lot. Definitely worth paying the money to help someone move house! Highly recommended this company! Great job"
"HIGHLY very high recommend. Very professional moved us within 4 hours and that was up and down 60 step streps. It was stress free I was able to meet a friend for coffee. So smooth. Enabling myself... 3 extra hours to set up house for son who has autism. Have to mention they always take into account needs of the household. Would I move with anyone else again no. 5*********"
Thats right a home removal service needn't cost the earth, request a FREE quote now. Whether two doors down or to Land's End, Huntingower Removals are here to take the stress from your next home move.